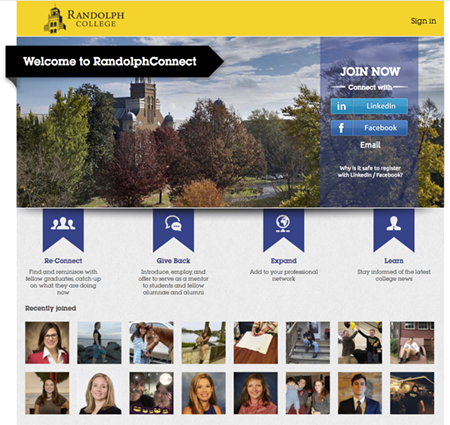 A Randolph College liberal arts degree provides students with excellent preparation for a variety of careers. Professional staff members are available to assist students in identifying and assessing possible career choices. It is essential for students to understand their competencies, interests, values, and personal characteristics in order to make good career decisions. LinkedIn allows our community to network with alumnae and alumni. It is a valuable resource that enables networking with professionals in specific careers that can help one research and learn more about a career choice and how the industry currently works as far as job searches go. Stop by the CDC so we can help you contact alums who are willing to assist students, alumnae, and alumni through mentoring via phone, email, or personal appointments. The Career Development Center (CDC) has joined forces with Career Dimensions to bring you a new online, self-guided, interactive program designed to help you select the right college major and plan your career based on your personal interests, values, skills, personality, and aspirations. Please contact the office for information on how to access your Career Dimensions account. Students can earn credit for internships, whether or not they are paid internships. An internship is a very valuable experience and can enable one to test drive a career. This type of exposure to companies and organizations proves to employers that you are interested in gaining experience in that particular line of work. Whether or not you wish to gain credits for your work on an internship, we ask that you complete the internship contract so that we may maintain a record of our students’ hard work. More information on how to do an internship for credit can be found here. Contracts submitted during appeal period must be accompanied by an Appeal Form regardless of reason or circumstances. After that date, Internships may not earn credit.